Filed under gadgets on October 19, 2014. At the end of September, Apple announced their new Apple Watch. I watched the announcement and found myself intrigued by the device; however, one thing kept nagging me, I can’t remember the last time I wore a watch on a regular basis. I think it was in the mid 1990s. After that period I only wore a watch whenever I put on my uniform for military duty and occasionally while I ran. The Apple Watch looks cool and appears to provide some interesting functionality, but if I’m not going to enjoy wearing a watch, I can’t see shelling out over $350 for one. Enter the Pebble. I won’t go into Pebble’s Kickstarter history, you can read that yourself; however, as a tech geek I’ve “watched” (see what I did there?) 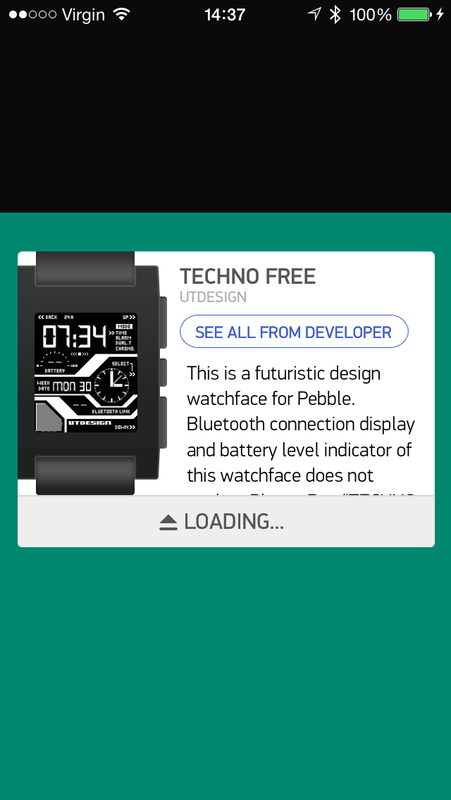 Pebble development and have been intrigued since the beginning. I almost made a purchase several times; however, I couldn’t get past the $150 price tag. It’s a watch made of plastic with a plastic band and as I’ve stated before, I haven’t worn a watch in years. I just pull my iPhone out when I need a time check or look at my computer. Occasionally I still find a clock on the wall. Soon after the Apple Watch announcement, Pebble made a clever and strategic move. They dropped the price of their entry level Pebble watch to $99. Given my interest in the Apple Watch and the new lower price tag of the Pebble, it seemed now was a good time to give a smart watch a try. I can now inexpensively determine if I will wear a watch full-time and if the additional functionality beyond time and date is of value to my everyday usage and workflow. I’ve had my Pebble about a month now and decided to share some initial thoughts for others who may consider a purchase. I will present my thoughts from the perspective of an iPhone user. Android users will have a bit different experience and if you do use an Android phone, I recommend you find a review from an Android perspective. The Pebble is first and foremost a watch and really a good one at that. Even without connectivity to the iPhone (more on that in the next section), it’s a cool watch in both appearance and function. Take the recent image I posted on Facebook below. This is a simple list of options that I have noticed in my short time with the Pebble. I am sure there are many more and exploration is part of the fun. The Pebble is a watch with a microprocessor, Bluetooth 4.0, 3D accelerometer, compass, light sensor, eInk display, and a rechargeable 5 to 7 day battery. By itself, it uses all this technology to display the time, date and direction. That sure seems like overkill for a watch, right? Add an iPhone and the Pebble becomes something else — an amazing notification center on your wrist. Let me put that in perspective. A watch by itself is a notification center. Traditional watches “notify” you of the time and date and some even provide notification of the chronometer’s progress and feature alarms to wake you. The Pebble takes these basic watch features and adds additional and limitless notifications. If your iPhone can notify you, via the notification center built into iOS, so can the Pebble. That’s the power of connecting the two devices and what makes the Pebble special. Notifications are not only visual, but also come in the form of a vibration. The vibration is effective and ensures you are aware of all notifications received. I’ve yet to miss an important notification. When a notification does arrive, it takes over the screen to provide textual information. Not only will you receive an alert of the iPhone notification, in most instances you can view a summary of the notification. For an email or text message, you can read who the sent a message and a brief synopsis of the message. A simple push of a button clears the notification from the watch and returns the selected watchface. The iPhone receives notifications via Bluetooth connectivity to the iPhone. This is a low energy connection. Initially I thought this connectivity would significantly impact my iPhone’s battery life. I’ve found no significant impact. Beyond notifications, Bluetooth connectivity is also used to transfer apps, watchfaces and firmware updates to the watch. Because the connection is via Bluetooth, you need to be within thirty feet of your iPhone. When you leave that thirty foot range, the Pebble will vibrate to let you know you are out of range. At that point, the Pebble is once again a simple watch. I quickly mentioned apps and watchfaces. If you want to add functionality beyond notifications, you install apps and watchfaces to the Pebble using the Pebble app as shown in the image below. As you can see in the image above, the app has two categories: apps and the locker. The apps and watchfaces are at the top of the Pebble app screen and the locker is on the bottom. The locker holds all your favorite apps. The current generation Pebble can only hold eight apps or watchfaces at a time due to memory limitations. The locker makes this bearable and ensures you have quick access to favorite apps not on your Pebble. Transfers are quick. Select the app or watchface and select the load option. The app or watchface will quickly load via Bluetooth to the iPhone and the progress represented by a vertical green bar that rises from bottom to top as shown in the image below. Pebble apps and watchfaces are small and transfer to the iPhone is quick. Want to remove an app or watchface from the Pebble? Select it from the iPhone app and touch the trash button. It is immediately removed and a slot is free for another app or watchface. This is a quick and simple process. On the Pebble itself, operation comes from the use of four buttons. The Pebble is not a touch screen device. 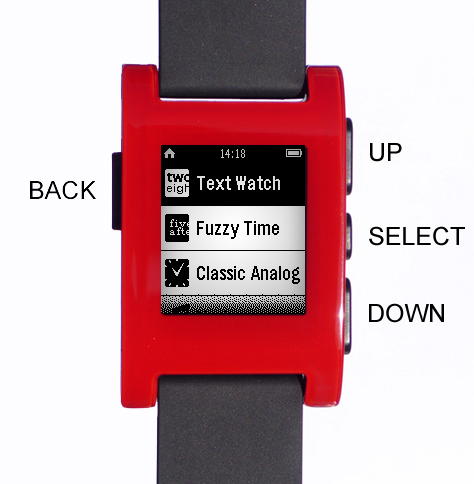 The image from the Pebble site below describes each button function. At first I thought the four buttons would confuse me; however, I find over time that they are intuitive. Now that we know how the watch operates, let’s look at the good and bad features of the watch. There is a lot to like about this watch and the list below highlights my favorite features. At $99 the device is now below three digits and at a price point that puts it inline with many iPhone accessories. Although the watch is plastic, the black model fits well in both my business and casual wear. I thought I would notice a watch on my wrist after not wearing one for many years; however, the Pebble and included band both go unnoticed until a notification arrives. Charger Simple and effective magnetic charger allows quick connection to encourage charging. Takes little time for a full charge. I don’t worry if I am in the rain or shower. Even though it is rated to 50 meters, I am not sure I would go for a swim with it on. With the included backlight available at a shake of the wrist, the eInk screen ensures I can view the Pebble in both the darkest rooms and the sunniest outdoors. The display is also the key to the battery life. I turn my watch off every night and get about six days on a charge. I receive a fair amount of notifications daily. As I stated earlier, if your phone can send a notification, your Pebble can receive it and this proves valuable during meetings or when in the car. Add even more useful notifications using the IFTTT service and the IFTTT iPhone app. I have a notification sent whenever it is raining or snowing outside. Since owning the Pebble, there have been two updates to the Pebble app and the Pebble firmware to add new features and shore up bugs. There is obviously a robust development team in place. There are a ton of apps/watchfaces and entirely too many list here. I list a few of my favorite apps in the Apps section)below. That’s a fine list of good things, so what could possibly be bad? Wouldn’t it be great if we didn’t need the phone? We just aren’t technologically there yet. Even the much anticipated Apple Watch will require iPhone connectivity. Android phone owners have many more app/feature options due to the open nature of Android operating system. iOS users are hampered, which leads me to my next item in this list. Using an iPhone, you cannot send a message, not even a canned response, back via the Pebble. 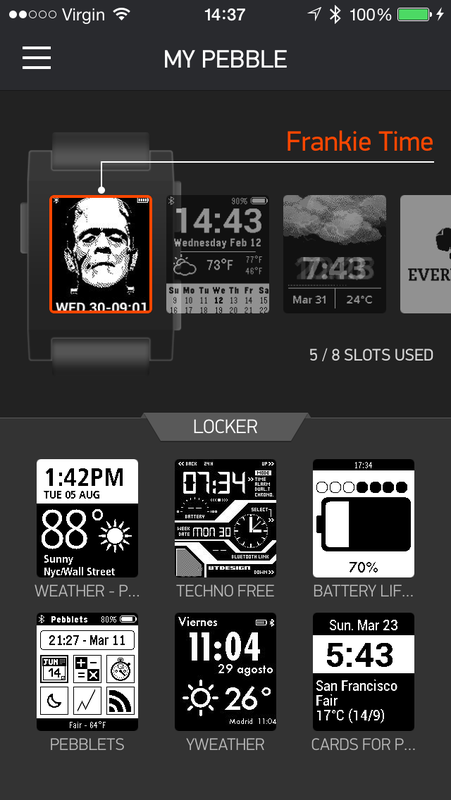 While the locker is useful for organizing and maintaining apps and watchfaces, 8 slots limit the Pebble. Here’s hoping a later Pebble hardware upgrade will include memory for additional slots. It is hard to review watchfaces at the Pebble store due to an overabundance. Even though the store includes some categorization, it doesn’t help discovery of the thousands of watchfaces available. I use the Nike+ iPhone app regularly and would like my Pebble to display my time and distance while running. This is a personal wish and not really a fault of the Pebble. There are other running apps I could use for this, but I have too many miles logged with Nike to make a change. Those are the limitations I have found. Overall though, I don’t find them enough of a distractor to not recommend the Pebble and if you are an Android user, two of those negatives go away. I’ve been mucking around the Pebble App store for hours and below are the only two apps I use regularly – and I have tried many. Access to notes on the Pebble can be a bit tedious. It is easier to simply break out my iPhone; however, you cannot deny the cool factor of bringing up a note on your watch. You can create a workflow that makes frequently used notes easily accessible. For instance, I use a feature that allows a long press of the down button on the right-hand side to quickly load the Evernote Pebble app. I then set the Evernote Pebble app to display my shortcuts upon startup. Handy for work notes that include copy machine, long distance and fuel codes that I can never remember. This app requires two pieces, the free Smartwatch+ Pebble app and the $2.99 Smartwatch+ iPhone app. Together the two provide additional functionality to the Pebble such as weather, calendar, camera control, stocks and GPS location. Lastly, the Smartwatch+ app allows the installation of another component called SmartStatus which is demonstrated in the image below. These two apps are currently the only two I use regularly. I reserve the last 6 slots for various watchfaces. I’m not going to include a section of my favorite watchfaces. Watchfaces are a personal choice and depend on your own style and need. For the “tech geeks” reading this, below is a list of of geekier things you can do with your Pebble. I don’t show how to do these things or which apps you need as a google search will provide that information; however, this list is representative of the Pebble’s advance capabilities. You really need a Pebble and the Pebble app to explore the many capabilities of the watch. It’s a blast when you find a really cool app or watchface to try out. I plan to continue to wear my Pebble. I’ve become fond of the watch and have found it very convenient in meetings, walking, running or driving. Instead of looking for my phone in a pocket, I simply glance at my wrist to see “what’s up.” I had forgotten how handy it is to have the time and date on my wrist and not need to pull my iPhone out of my pocket or how cool it is to receive a phone notification that includes caller ID. My use of the Pebble has made my want for an Apple Watch subside. Granted the Pebble is not as glamorous or probably as well made as the Apple Watch, but at $250 less, and that’s for the cheapest Apple Watch, it is much more affordable. With the Apple Watch I worry about battery life, weight and drain on iPhone battery life. My thought is that the Apple Watch will be a better product in its second iteration and possibly cheaper. Who knows though; upon release of the Apple Watch into the wild and we see actual reviews, I may be intrigued due to my fondness for the Pebble. Keeping my fingers, and wallet, crossed that I can hold out for version two of the Apple Watch. The Pebble Steel is an attractive solution and very well could be my next smart watch when it receives a version 2 hardware release. Given the numerous firmware/software updates, I anticipate even greater functionality for all Pebble devices and look forward to seeing what comes next. I also can’t help but wonder if iOS 8 and the new extensions feature won’t bring even more capabilities to the Pebble platform. In conclusion, if the thought of a smart watch appeals to you, my guess is the Pebble is your best choice. At its current price point and capabilities, it is a great way to determine if a smart watch fits your lifestyle. I would even suggest that if you aren’t interested in the advanced features of the watch, the Pebble as a watch isn’t a bad choice. Changing watchfaces on a whim and having quick access to notifications alone make this device a win. For those of us that are bit more technologically sophisticated, read…”geeky”, the apps and feature rich watchfaces are just icing on the cake. Want a Pebble of your own or as a gift for the holidays? Check Amazon for both the Pebble and Pebble Steel? Have a cool Pebble App to share or a tip/trick/hack? Leave it in the comments section below.